24 Hour Ration Packs do the job. They provide you with everything you need to keep yourself fed and watered for a 24 hour period (except for water). It may not be exactly luxury, but you can't knock the pleasure of chomping on a bar of chocolate on stag at 03:00 hrs. 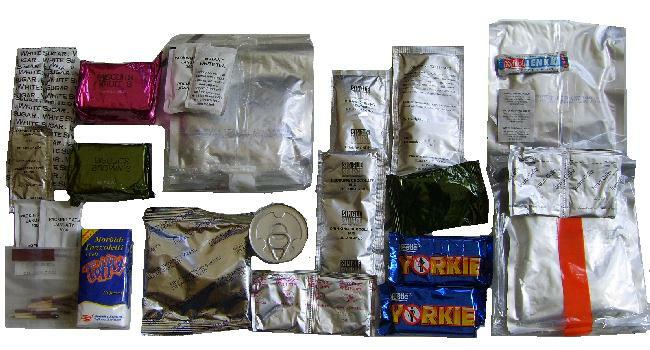 Todays 24 Hour Ration Packs consist of 'boil in the bag' meals which means that the rations can be easily stashed in your kit or pockets taking up very little room. A vast improvement on the old style ration packs which were very awkward, being all tinned. So how come the old rations tasted better? Great meals like 'Babies Heads', Chicken Supreme, Chicken Curry and Stewed Steak. Coming soon to a foxhole near you! A new improved (and doubtless cheaper) Ration Pack. Things just haven't been the same since the Bacon Grill was binned. This page was last edited on 26 November 2009, at 15:21.